Today marks Safer Internet Day. A whole day dedicated to teaching everyone how to use the internet safely. Furthermore, it makes children and adults realise what the risks are and what the consequences could be. Anyone who uses the internet should know how to use it safely. Whether it’s protecting accounts or using the internet, you should always be safe. In addition, to commemorate Safer Internet Day we have dedicated a blog on how to be safe online. Firstly, a lot of websites and accounts require a password in which you need to enter to access. This is highly important that you do not use a password that is easy to guess. For instance, your name, favourite colour, date of birth etc. All these are primary examples of what not to use. TIP: Use a password that would have a low risk at getting the password cracked. As children become more involved with online gaming and social media it is important that they also know how to create strong passwords. Hackers can often come through unsecured websites and you could potentially be oblivious to it. Malware could be running in the background of your PC, causing further damage and spreading to other machines via programmes such as email. 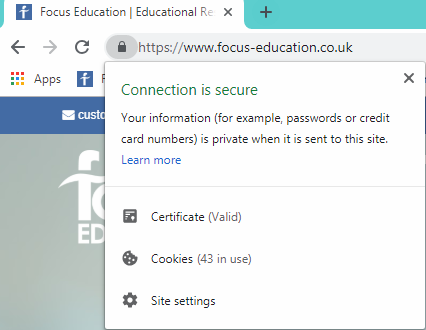 To make sure you are less at risk, make sure there is a secure and closed padlock next to the website address. Most importantly, you need to ensure that your own website is protected. Otherwise, this will drive your potential customers away. If your website isn’t secure, then you will need to purchase a HTTPS or SSL certificate. Lots of online content could potentially contain malware. This can depend on how secure a website is which you can tell from the previous point. Downloading files on to your PC means that the chance of releasing a piece of malicious software is increased from even visiting the website. Should that file contain Ransomware, this could be deadly if you do not have the required back up on your computer. It can travel between computers on a network, in a school this could cause havoc. Anti-virus and anti-ransomware will help detect and attempt to block the threat from causing more damage to your computer. Without this level of protection, you could suffer financial loss, data loss, file encryption and much more. Once your personal information is exposed and made public online, people can use this to their advantage. Many people make the mistake of including their address, mobile number, full name etc. online and this could lead to serious consequences. Fraudulent activity is increasing, so your chances are increased significantly if any personal information is published online. Accounts require you to input your personal data but that is often stored securely. Whereas if you published information on a social networking site, more people have access to this freely and can easily be used without your knowing. The best way to avoid any fraud is by keeping all your information offline and to yourself. It is better to keep it confidential than publish it and risk problems along the way. Teaching children about sharing personal information is crucial. Make sure they know the risks of sharing where they live or go to school. Make sure children are aware not to believe everything they see and read. Although this can be aimed at children and teenagers, it can be aimed at adults too. Many people use the Internet for different purposes such a gaming, social, dating or even business purposes. The main thing to remember is not everyone says who they say they are. There have been many cases in which people befriend others online to gain trust. The best way to meet someone is offline which is where you can build a relationship and get to know the real person, rather than becoming a target to catfishing. The web is a dangerous place and it provides a primary opportunity for older adults to prey and entice younger children in to becoming their friend. This can lead to grooming and pressure into children doing things that they don’t want to do. Children need to know the problems with safety on the internet and that they should not speak to strangers or meet them in the real world. Encourage children to only be online friends with people they know in real life and talk to a parent or carer when something they’ve seen upsets them. The more a child knows, the bigger and better the awareness. Talk to children about how the things they do online paint a picture of themselves. They need to be careful what you publish such as being respectful for the opinions of others and beliefs. Just because someone may not have the same opinion as them, this does not give them the opportunity to boycott them and cause unnecessary conflict online. Cyber bullying is becoming more prevalent and most young people will experience it at some stage. 56% of young people have seen others be bullied online. It doesn’t just happen on networking sites, messaging apps but gaming sites. Messages can go viral and be spread through classrooms and schools easily. The most viscous gossip and rumours are often spread by people who were once best friends who you trusted with secrets and confidential information. Help children know when to take a time out. It is okay to take time away from certain friends that make them feel bad about themselves. To sum up the Internet, it can be a dangerous place for technical aspects and for personal reasons. The best way to stay safe online is to educate others and be vigilant about what you publish and what actions you take. Always make sure children and other young adults know exactly how to use the internet safely so none of the above incidents happen to you or to them. Follow AspectIT on Twitter @AspectIT to keep up to date with their latest news and blogs. To find out more about their services and what they have to offer head over to their website by clicking here. Aspect IT is an IT Support company assisting small and large organisations throughout Manchester, Lancashire and West Yorkshire on a comprehensive range of IT support. What do we mean by ‘mastery’?